Overall, despite the hang ups I had going into the series - mainly that it was really hard to give up the nostalgia for the old animé and the English dub (as cut up and bastardised as it was), and I wasn't too keen on the new artstyle that skewed closer to Naoko Takeuchi's original manga - but I really enjoyed Episode 1. It's still Sailor Moon, in so much that it's pretty transformation sequences and ridiculously cheesy plots to take over the world from the bad guys, and a whole lot of campy fun. But anyway, thoughts! There seems to be a lot more foreshadowing of Serena's Usagi's (I CANNN'T HELLLP IIIIT) true nature as the Princess of the Moon in this version compared to the earlier episodes of the original Animé. We see a lot more of Usagi and Mamoru and glimpses of her dreams of the moon than what I can remember of the old show. Speaking of foreshadowing, we also get a lot of mentions of Sailor V - I know the first episode of the series mentioned her a bit, as it's a Sailor V game Usagi plays at the arcade, but we get a lot more of her in Crystal. It's nice to see Minako a bit more, considering it'll be a while before Sailor Venus actually enters the scene. The opening is awesome, and I can't stop relistening to Moon Pride on the NicoNico archive. It's no Moonlight Densetsu, and I kinda miss the more abstract, freakier version of the opening that the original animé had, but it's energetic, funky and perfect for Sailor Moon. Revo continues to be great! I didn't really like the ending song though, it's a bit slower and ballad-y - but it's alright. Aside from those though, the music in the episode itself is kinda sparse, so it's hard to give much of an opinion - but the choral music for Sailor Moon's transformation sequence and when she uses her Moon Tiara Magic (dammit) Moon Tiara Boomerang were really cool. I think the art style works a bit better in motion that it looks in the promo art - and although the character's faces aren't as overtly emoted as they were in the original series, they're not as blank as I feared they would be. There's some nice little moments that touch on the extravagant reaction animations that were a hallmark of the first series' goofier moments, but it's much more subdued here and fitting of the aesthetic the show's going for - hopefully we get more of this throughout Crystal. I know it's my problem being hung up on it, but man, it's really jarring seeing Naru/Molly and Umino/Melvin and not instantly hearing their DiC-dub voices in my head. Apart from that, the voice acting seemed good, as far as I can tell - I'm still not particularly familiar with watching a lot of undubbed Animé, so I'm by no means an expert. Apparently only Usagi's voice actress is unchanged from the original cast, but everyone sounded fine. I like Luna's Japanese voice a lot! I can't really say much about the story because, well... it's not just the same story (Usagi discovering her power and foiling Jadeite's really dumb nefarious plan to steal people's energy through... discount jewellery), it's basically an almost literal shot-for-shot remake of the original Animé's first episode. I know Crystal is meant to follow the manga a lot more closely than the original series did, and the opening is obviously going to be very similar as it's how the manga itself starts out, but I wasn't honestly expecting it to be so similar to the first Animé. It was great from a nostalgia perspective - it was basically Sailor Moon's equivalent of a HD remaster - but hopefully Crystal will do more of its own thing as it progresses soon enough, as the original series began to diverge from its roots very quickly. Tuxedo Mask is still as hilariously useless as I remember. I love it. Although in the original I don't remember him bumping into Usagi outside the arcade whilst wearing his Tuxedo. Your 'disguise' is already laughably ineffective already, Mamoru, why are you running around in your Tuxedo in broad daylight too!? AMI TEASE FOR NEXT EPISODE!!!! Yay. I love Ami, she's my favourite Sailor Scout (honestly, it's mainly because my favourite colour is blue so the blue haired, water themed Sailor was my go-to pick. I was a pretty simply pleased kid.) - but it might just be my memory playing tricks, or did Usagi have a few episodes on her own in the original before Sailor Mercury showed up? It seems like Crystal is getting straight to her, which is great in my books. 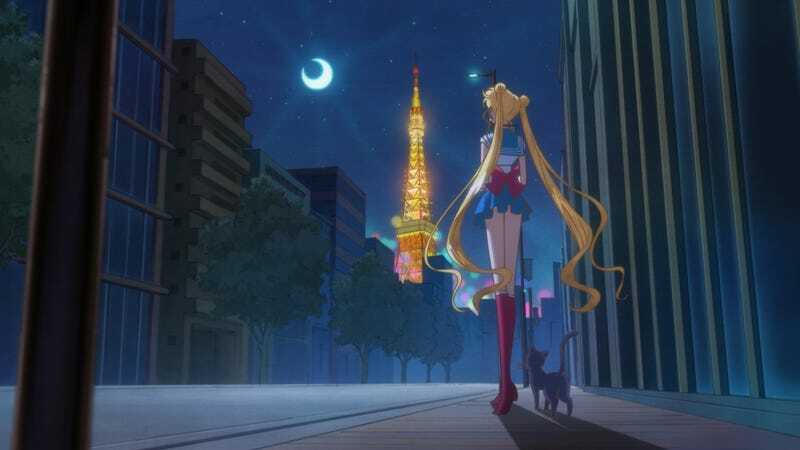 So yeah, overall Episode 1 was a really fun re-introduction to all things Sailor Moon for me, even if it was a little weird to see basically the identical episode from the original again just in the new style. It's going to be killer waiting 2 weeks for the next episode though - bi-weekly, why!? Why!? I want mah Sailor Moon fix, now! Pretty Guardian Sailor Moon Crystal airs on the first and third Saturday of every month at 7pm JST, with subtitled simulcasts airing on Hulu, Crunchyroll and (thankfully, because otherwise it seems IMPOSSIBLE to watch this series in Europe without a VPN) NicoNico. You can still watch the archive of Episode 1 for free for the next two weeks here. Did you like it? Share your thoughts in the comments below!